In this series “Building an RV” I will try my best to guide you through all the steps of the home building process. Part one mainly deals with the preparation phase. So you have seen all those shiny and faster than lightning RV's popping up at fly-inns and air shows. You have read a few articles on the internet and have decided that you can do it as well. Building your own RV is an amazing journey and very soon along the way you will find that you are talking a different language and that you are acquiring skills that you never had before! But first things first. There are a few different RV models available and potential builders often find it challenging to choose a suitable model. Then the option between Tip-Up or Slider makes it even more difficult to choose. 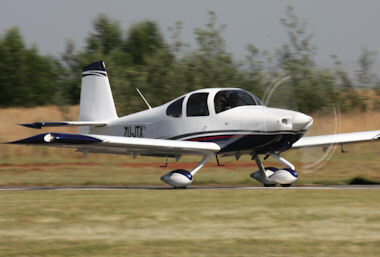 The most popular models are the RV-7, RV-8, RV-9, RV-10 and the RV-12. 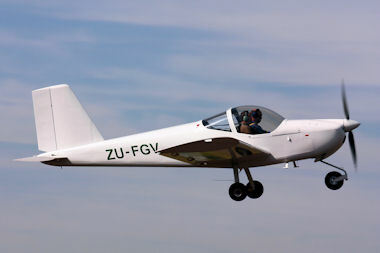 The RV-7/7A is Van's most popular design. Since the RV-7/7A replaced the most popular kit aircraft in history, Van's RV-6/6A, this is probably no surprise. About 70% of customers prefer side by side seating and the RV-7/7A has a roomy cockpit that will easily accept two 6' + adults with sufficient leg, head and elbow room to stay comfortable for three to four hours at a time. The seating arrangement puts both occupants on an equal footing - standard dual controls and optional dual brakes give either occupant full control with equal visibility. Engine options include 160hp, 180hp and 200hp but the Lycoming O360 180hp engine seems to be the power plant of choice. At a cruise speed of 200 mph and a service ceiling of 23,000 ft this aircraft is perfect for long cross-country flights. In 1995, Van's decided to re-visit the tandem seating concept. Even though the side-by-side RV-7/7A had become the most popular homebuilt design ever, there were still a significant percentage of pilots who really wanted centerline seating. The consensus seemed to be that a roomier tandem airplane with better cross-country capability would be popular. 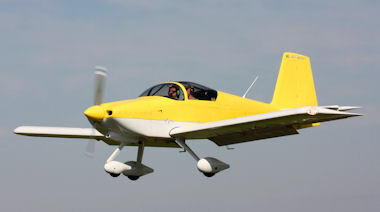 The RV-8/8A retains the fighter-like feel of centerline seating, but the wider fuselage contains cockpits that accommodate large people in comfort. Two baggage compartments, one forward and one aft, keep even large amounts of luggage well within the weight and balance envelope. Pilots up to 6'7" fit in the front. Engine options and performance of the RV-8 is pretty much the same as for the RV-7 with the exception of a theoretical 4 mph faster cruising speed. 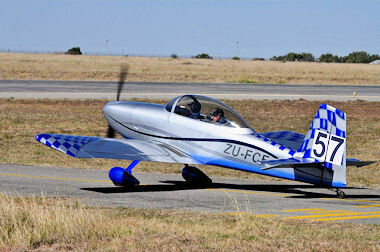 Blazing speed and "wring-it-out" aerobatics are not important for many pilots. Their day-to-day flying consists of local trips, relaxed cross-countries, and occasional long flights. The RV-9/9A was designed to do its best in this environment. The performance it provides is useable every day. It's so easy to fly that low time pilots can make a quick and painless transition. Its short field performance permits it to easily use the same airports other RVs use. When it's time for that long cross-country, the RV-9/9A will get you there and back as quickly as any similarly powered RV. What sets the RV-9/9A apart from other RV designs? In one word, the wing. It is longer and narrower than the wings of the RV-7/8 series, and uses a new Roncz airfoil. The increased span allows it to climb well on low power and glide a long way. The flaps are a long span, slotted, high lift design that allows the airplane to land slower than many primary trainers. A simplified constant-chord horizontal tail and large vertical tail are proportioned to work with the longer wing. The robust fuselage and cabin are identical to the RV-7/7A and there are the same sliding/tip-up canopy and trigear/tailwheel landing gear options. Engine options include 118hp, 135hp and 160hp and a cruise speed of 189 mph when equipped with the 160hp engine. 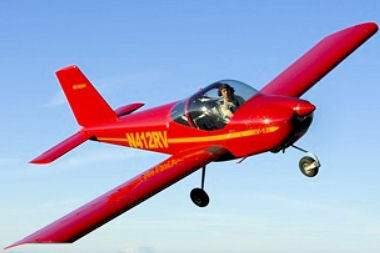 The RV-10 is a four-person airplane, not just an airplane with four seats. It will carry four passengers, full fuel and sixty pounds of baggage. The cabin accommodates four full-sized adults. Both front and back seats will hold people 6'4" tall and provide them with truly comfortable leg and headroom. Composite gull-wing doors let occupants board from both sides. 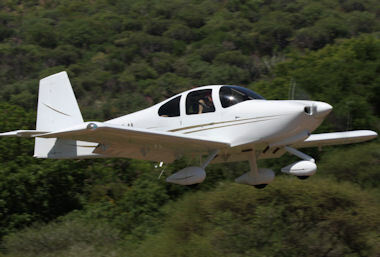 The RV-10 is designed to fly well on various versions of the bulletproof six-cylinder Lycoming O-540 engine, developing between 235 and 260 hp. When many pilots say "performance", they really mean "speed." 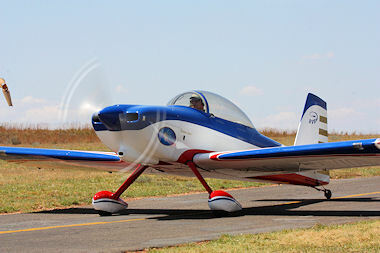 The RV-10 is quite a fast airplane with a cruising speed just under 200 mph but speed is only part of the story. The RV-10 derives its high cruise speed from a clean, light airframe, instead of from a big, consumptive engine. This means that cruise at lower speeds can be very economical. Company pilots often choose to cruise at 50-55% power and take advantage of the economy available there. At 175 mph, the RV-10 is getting more miles per gallon than most of the luxury cars, pickup trucks and SUVs it is flying over. 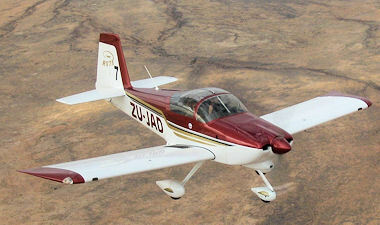 The RV-12 is Van's newest design, the latest in the most successful line of kit aircraft in the world. It's a two-seat all-metal side-by-side airplane with a large cabin that seats the occupants ahead of the wing spar for maximum room and superb visibility. There are several features that make it a unique RV. 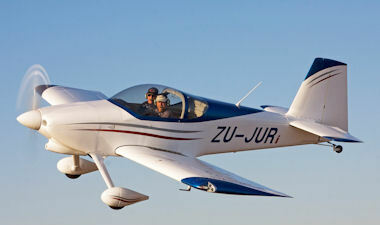 The RV-12 meets the certification standards of the Light Sport Aircraft category. The wings are quickly and easily removable. Using methods proven over decades in high-performance sailplanes, two people can have the wings off an RV-12 in less than five minutes, making the airplane easy to transport on a trailer and keep off-airport. It is powered by a Rotax 912ULS 100 hp engine. This rugged little engine hasn't become the world-wide standard in light sport aircraft by accident. Extended real world experience has shown it to be durable, reliable, and economical. It can use either unleaded autogas or 100LL. The best news is that it flies like an RV! 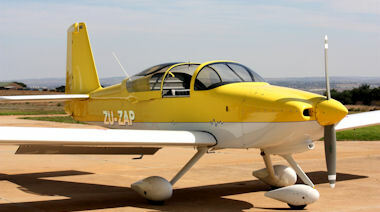 The RV-12 has all the performance the Light Sport Category permits as well as excellent handling qualities at all speeds. It is very docile on take-off and landing and pleasantly quick and agile in the air. I have built both tip-up and slider versions and from a building complexity perspective, there is no difference. The slider canopy can be opened during taxi and provide cool air flowing through the fuselage which the tip-up does not provide. The disadvantage of the slider is that the roll-bar is located forward and to a small degree obscures the visibility. The tip-up has an unobstructed view but while it is open, it may be vulnerable to wind and gusts which may crack the canopy and you therefore have to keep it closed most of the time. I often see and experience that many home builders do not know what to do when it comes to all the paper work and requirements in order to get your aircraft legally flying. The one big difference in South Africa is that you do not have to prove that you have actually done more than 50% of the work. In the USA they refer to this as the 51% rule. There, the kit manufacturer actually has to certify that the builder still has to do at least 51% of the work. I often hear comments like “Why couldn't Vans make this bloody bracket- now I have to file and sand for a whole day!” Simple - the 51% rule. The first step once you have taken the plunge and ordered your dream kit, is to get a builders number from CAA. This way you are officially registered as a home builder this paves the way for what is to come in future. In order to do this you have to complete form CA24-01 and submit it to the CAA. You can download it from the CAA website (www.caa.co.za and search for NTCA). Please make sure that you have the latest form. Within a day or so, CAA will send you your Builder Number and you are ready to go. Next month we will move on to unpacking your kit, doing an inventory, etc.